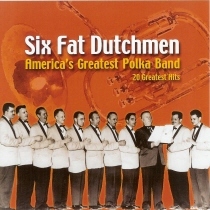 Swingin' Dutchmen Polkas from the great Six Fat Dutchmen! International Polka Music Hall of Fame ® Harold Loeffelmacher from New Ulm, MN led the Six Fat Dutchmen for decades. The Six Fat Dutchmen found themselves in Downbeat Magazine being named the number one polka band in the country for seven years in a row as well as several appearances by Harold Loeffelmacher on the Lawrence Welk Show. The Six Fat Dutchmen numbered as high as twelve band members and traveled throughout the Upper Midwest of the USA and beyond. Through the years they recorded over 800 songs with 14 years on RCA Victor and 10 years on Dot Records. Don’t miss the great classic sounds of the Six Fat Dutchmen!